The Blog of a Data Scientist working for Her Majesty's Revenue and Customs (HMRC) in the United Kingdom. [A] Method for transforming lexical co-occurrence information from natural language into semantic patterns in an unsupervised manner. It employs two stages of co-occurrence information extraction—semantic and relational—using a different algorithm for each stage. The algorithms used are statistical, but they employ nonlinear dynamics and machine learning. We are made aware of the larger context of all the narrative interviews of the cluster and the prominence of certain concepts. It ensures that we do not become fixated on some concepts to the detriment of others. Leximancer uses a combination of techniques such as Bayesian statistics that record the occurrence of a word and connects it to the occurrence of a series of other words. It then quantifies those outputs by coding the segments of text, from one sentence to groups of sentences. As the data set presented here is relatively small, we are looking at the data sentence by sentence. Each word or concept is associated with a subset of related terms. The next step involves the machine learning from the concepts already uncovered and linked to other concepts creating a ‘concept space’. It then iteratively creates a thesaurus around a group of seed concepts. This information is visualised using network analysis. Emergent themes are then visible to the user, and are expandable using the map visualisation that links directly to the areas of the data in which the concept occurs. The themes map enables a quick reading of the narrative interviews. It lets us see what the dominant themes are, rather than imposing our own interpretations on the data. The proximity of two concepts indicates how often or not they appear in similar conceptual contexts. So, when two concepts are placed at a distance from each other, it indicates that they are not used in the same context. The themes are the coloured circles around clusters of concepts. The lines or pathways navigate the most likely path in conceptual space between concepts in order to aid reading the map. The connectivity score reflects the degree (equivalent to degree score in network analysis) to which the theme is connected to the other concepts in the map. 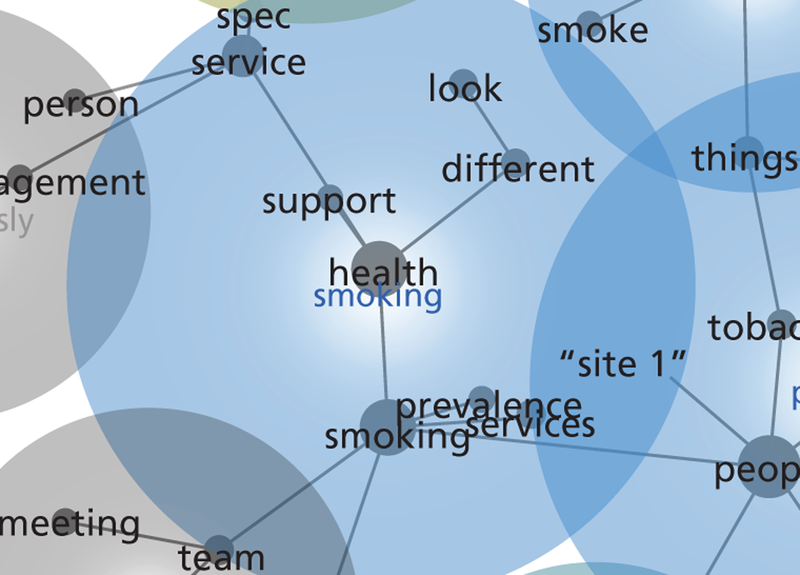 At site 1, of the top 20 most important concepts, two – smoke/smoking and tobacco – are the focus of the cluster selected from the sociograms for the ‘Goes To’ network in round 2. This is the specific problem identified by the cluster. They are more generally concerned with health of people; however, they have focused on smoking as the main hindrance to achieving public health. As the cluster is involved in public health, this is not surprising. The focus is on smoking. The clusters’ values and preferences are related to the urgency with which a working solution is required and, looking at the concept of time in Table 26 with an absolute count of 67 and a relative count of 20%, it is present in the clusters cognition. The source of that urgency is thematically related to meetings, issue, year, local, working, person, services, public and support. The value present in the cluster is that of public or more specifically public health. There is a level of uncertainty surrounding the problem of smoking as the suppose (absolute count of 99, relative count of 29%) and probably (absolute count of 96, relative count of 28%) concepts are prominent for this cluster, with obviously (absolute count of 91, relative count of 27%) less prominent. The range of activities which can be used to share and exchange knowledge related to the specific problem of smoking are within the cluster. These activities are situated within the context that the cluster is in. After a 20-year period of market-inspired organisational reform (managerialism, or the New Public Management), concepts such as, service (absolute count of 159 and relative count 47%) and public (absolute count of 126 and relative count of 37%) could be indicative of a social policy-orientated outlook rather than a managerial one. The thesaurus list does contain the more market inspired concept of management. However, management does appear, with a low absolute count of 30 and a relative count of 0.9%. It appears that the cluster is social policy orientated. However, this is not unambiguously so. The concept of service is related to spec, management, provider, year, smoking, look, working, public, health and doing. The concept of public is related to health, management, working, probably, team, smoke, year, issue, service and different. So, the concept of service is orientated towards management rather more so than public, health, and public relates to health, and management more than service. What this highlights is the level of ambiguity around the concept of management for the cluster. Concepts that are directly related but not necessarily strongly semantically linked can be far apart on the concept map while concepts that are strongly semantically related will be close to each other on the concept map . . . concepts that occur in similar semantic contexts tend to form clusters (or gather together). FIGURE 30 Leximancer map of the 11 site 1 narrative interviews combined. General concepts are in black with themes in colour. The coloured circles indicate the thematic space of a theme with the label of that theme at the centre. The words in black are the concepts and the lines between are links that tell us which concepts are semantically linked. When two or more circles overlap it indicates that the themes are semantically related to each other. 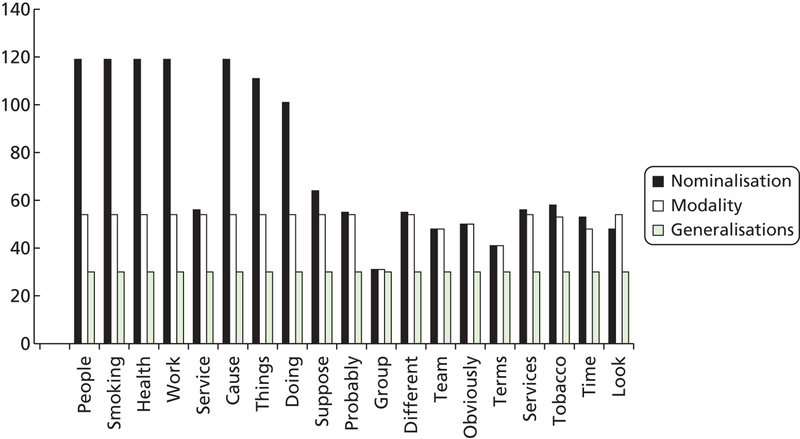 Figure 31 shows for the cluster the most dominant theme is SMOKING, followed by PEOPLE, CAUSE, TIME, SAYING, OBVIOUSLY, INVOLVED, GROUP, TERMS, LEVEL, TALK, TOBACCO, ALLIANCE, MONEY, THOUGHT and USED. The proximity of SMOKING, PEOPLE, CAUSE, TIME, OBVIOUSLY and INVOLVED themes indicate that they are related to each other in a chain-like manner. 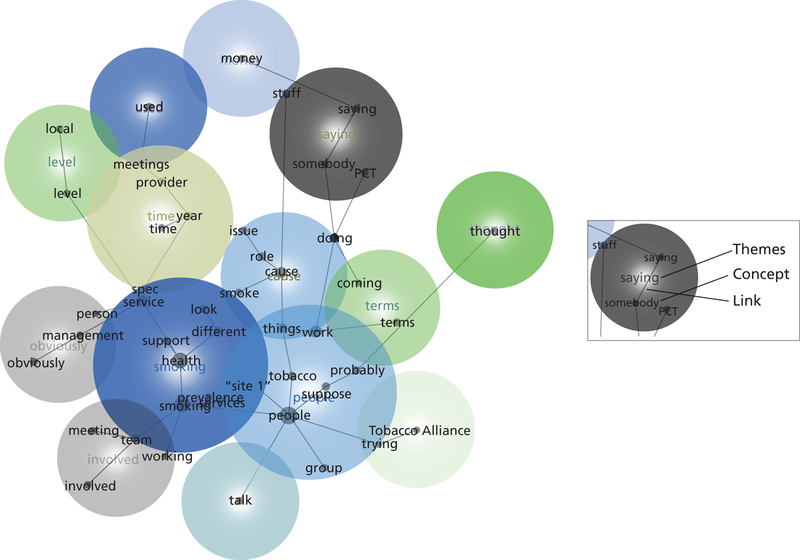 GROUP, TERMS, LEVEL, TALK, TOBACCO, ALLIANCE, MONEY, THOUGHT and USED are semantically isolated. The name like concepts of Tobacco Alliance and PCT are not directly connected to the dominant theme of SMOKING, while site 1 is within the SMOKING theme. Therefore, site 1 resides in the same semantic space and is connected to SMOKING, while Tobacco Alliance and PCT are not. 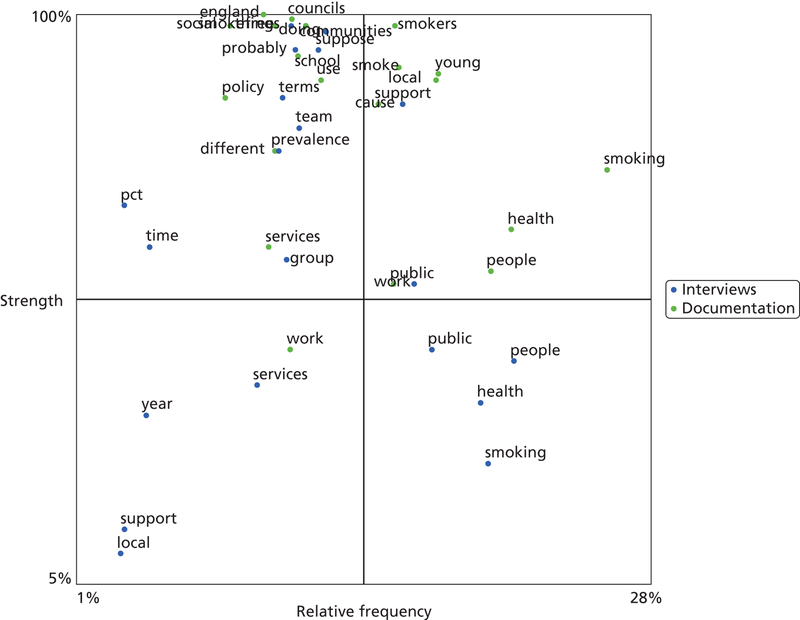 Focusing on the theme of SMOKING (see Figure 31), it is associated and linked with smoking, health, services, prevalence, support, spec, site 1, different and look. However, smoking is not linked directly but indirectly to management, team or working. 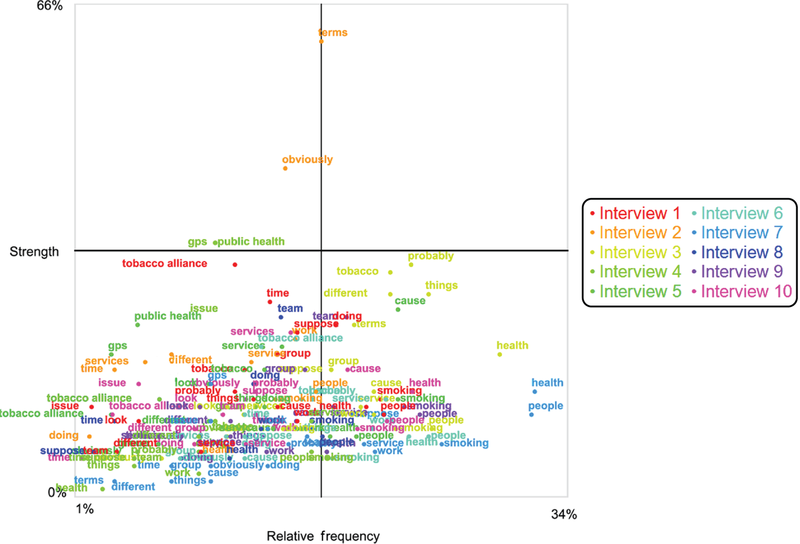 SMOKING is also semantically associated with management, as the two themes overlap slightly. FIGURE 31 Close-up of the SMOKING theme from site 1. This is the position that speakers express what they tacitly know through grammatical patterns without being aware they are doing so. By carefully analysing the grammatical patterns of ‘under-representations’88 in texts, we can bring to the fore the tacit knowledge assertions of our interviewees. The next phase of the analysis of the interview texts makes explicit that which is tacit by looking at the function of the grammatical choices the interviewees are making. Systemic Functional Linguistics (SFL) is an analytical method from Halliday89 which is concerned with grammar’s functionality or, rather, how it creates and expresses meaning. It regards grammar as a system of explaining things by referring to other things. Each system of the interconnected words construct the ‘meaning potential’ shaped by the semantic choices being made and the activity in the brain. SFL’s position is that when text is analysed it brings to the fore the meaningful choices made at the expense of the choices that were not made. This analysis goes beyond the usual procedures employed by others who typically look at scenarios90,91 and narratives92 and then deliver a running commentary on the text. The functionality in language is central to language or rather the function of language is to convey experience and to generate interaction with others. With the construction of experience and interaction needing cohesion and continuity of text, a second function of language emerges – that experience and interaction require text. According to SFL, language has three ‘metafunctions’, ideational, interpersonal and textual, with the term ‘metafunction’ being used to ensure that function is regarded as an integral component of the interaction of the three terms. The texts collected during the narrative interviews are ways of being that allows the relationship between the text and persons involved to bring in the ‘below-view patterning in language’.88 SFL allows us to bring out the ‘tacit assumptions and ideological assumptions’ that characterise certain domains of discourse. This corresponds with Halliday’s interpersonal function of language. So when analysing the texts this accounts for social practices that are being realised in the texts. According to Zappavigna,88 these attempts at project co-ordination, formulating hypotheses, integrative methodologies, facilitating dialogue, use of metaphor, ability to engender trust, and ability to envision the future based on an understanding of the past are evident in the choices they make when talking about what they do. Analysing the specific words they use can highlight for us when they are facilitating knowledge. The use of nominalisation in speech indicates an ongoing project. By looking at when the interviewees use nominalisation, we are seeing where the interviewee is presenting an ambiguous or unambiguous relationship with the statement they are making. When they refer to processes as things such as ‘health improvement’, which is an ongoing project that they are co-ordinating, they in fact see is it as a project and they refer to it as an entity in its own right. The meaning of ‘a person’s need to do something’ (i.e. improve health) has become condensed with the use of ‘ment’ in improvement. Nominalisations are demarcated by the use of suffixes (able, ad, age, agogy, al, ality, ative, ment, to name only a few) which are placed at the end of words. Processes become things that act on other processes as things, then this relation of ‘acting upon’ itself becomes a thing. The unfolding of activity sequences are finally re-expressed as parts of composition taxonomies, as criteria for classifying the abstract entities they modify. Instead of a sensually experienced world of unfolding processes involving actual people, things, places and qualities, reality comes to be experienced virtually as a generalised structure of abstractions. The use of modality in speech indicates the formulating of hypotheses [is, are, were] – ability to envision the future [should, would, will]. Examples of modality are can, could, should, would, might, must and probably (this list is not exhaustive). They are an indicator of the level of certainty or uncertainty that the speaker has in regard to the assertion being made. Modality contains meaning by embedding the agent motivating the opinion expressed. The use of modality in text under-represents agency or cause. For example, an IT professional might say ‘I should reassess this requirement’. The use of the modal verb should is masking the ‘who’ or ‘what’ motivating the process of reassessing. It could be a command from a senior and not from the interviewee. Rather than saying that something is a fact, speakers make generalisations in order to sound less direct and allow for uncertainty in the statement that they are making. Generalisations indicate to us the cognitive process and contents of the statement. Generalisation contains meaning through underspecifying a concept and pattern. Examples of words that demarcate generalisations are some, a bit, a few, any, part of, complete, entire, none, no one, nothing and zero (again to name only a few). The generalisation usually follows these words. General terms are not necessarily more abstract; a bird is no more abstract than a pigeon. But some words have referents that are purely abstract – words like cost and clue and habit and strange; they are construing some aspect of our experience, but there is no concrete thing or process with which they can be identified. Halliday and Matthiessen, p. 61595Generalisation underspecifies meaning and highlights assumptions; examples are system and programme. Within Leximancer, there is a pre-set ability to conduct sentiment analysis. Simply put, sentiment analysis measures the attitude of a speaker or writer towards a concept, whether they express something positively or negatively. In order to conduct cognitive analysis, we have combined sentiment, nominalisation, generalisation and modality. By doing so we focus on what the interviewee holds to be pre-supposed or tacit knowledge, thereby enabling us to answer two questions: what do they know, and what do they not know? What types of knowledge is the cluster concerned with? Taking each concept as highlighted by Leximancer and extracting the complete thesaurus of all words related to that concept by Leximancer, we then count the number of uses of nominalisation, modality, generalisation and agency in relation to each concept (see Table 27). It is clear from Table 27 and Figure 32 that the cluster is predominantly involved in the use of nominalisations; this indicates ongoing projects being perceived as entities in their own right rather than processes. What Table 27 and Figure 32 do not tell us, however, is whether the cluster perceives these projects are ongoing or finished, whether they are making claims with epistemic certainty or uncertainty and whether there assertions are based on assumptions or ‘fact’. FIGURE 32 Nominalisation, modality and generalisation frequency for each concept of site 1 interviews. What follows is an automated report generated by limiting the number of concepts to 23 listed in Figure 30, above, plus 2 GPs, and Public Health, as they were highlighted by Leximancer as potential names. The categories of interest are the interviewee data files. So, what we get is an analysis of each interviewee’s use of the top concepts for the cluster. As well as that, the technology within Leximancer that analyses positive and negative sentiment has been altered to include categorisation of terms that indicate nominalisation, generalisation and modality. The results are presented in a high-level, visual chart displayed in a ‘magic quadrant’ format. The axes are relative frequency, which is a measure of the conditional probability of the concept given the categories of Sentiment, Nominalisation, Generalisation and Modality (cognitive analysis – positive or negative). We are looking at the occurrence of positive or negative words when ‘health’ is mentioned. The axes labelled ‘strength’ is a measure of the conditional probability of the category cognitive analysis – positive or negative given the particular concept (e.g. how often is ‘service’ mentioned with positive or negative cognition?). There are four areas to the quadrant, and the different colours of concepts refer to different interviewees’ accounts. Concepts in quadrant one (bottom left) are weak and less prevalent within the interviewee’s data – this is where negative Sentiment, Nominalisation, Generalisation and Modality manifest. Concepts in quadrant four (top right) are strong, prominent and more likely to co-occur with the category. This is where positive Sentiment, Nominalisation, Generalisation and Modality sit. Figure 33 indicates a low frequency for the majority of concepts except for terms and obviously and these are both from one interviewee. A majority of the concepts are also viewed negatively on the negative cognition scale. FIGURE 33 Cognitive analysis quadrant of top 20 concepts: frequency and strength results for site 1. When the data from Figure 33 are compared with the cognition scale frequency and strength results of the cluster, this generates Figure 34 (presented below). The concepts cause, service, health, smoking, people and work are viewed moderately positively on the cognition scale. They have also scored highly for cognition scale for each concept of site interviews in Figure 33. FIGURE 34 Cognitive analysis quadrant of top 20 concepts: frequency and strength compared with cluster results for site 1. 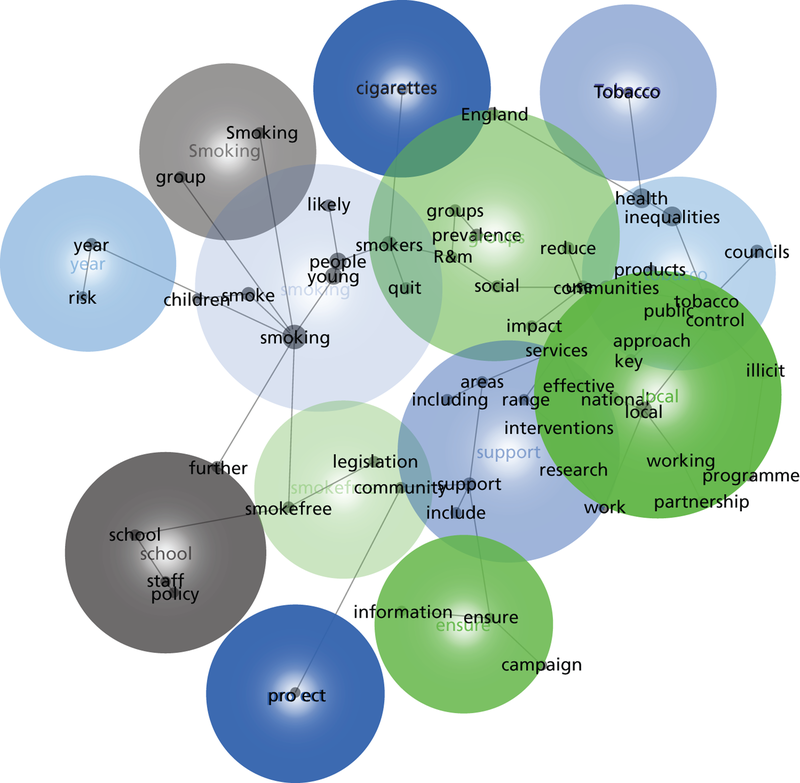 The most striking aspect of Figure 34, which shows all interviews combined as well as the individual interviews, is that the Tobacco Alliance, which has a high frequency score, also has a negative or weak cognition score, meaning that the concept Tobacco Alliance is used in a manner that indicates that the cluster does not know what the Tobacco Alliance is, or what it intends to do. Work, cause, smoking, people, health and service are all within the positive quadrant of the scale, indicating that these terms are used positively and that the cluster knows what these things are. For the cluster, the concepts public, things, doing, suppose, probably, group, different, team, obviously, terms, tobacco, time, look, Tobacco Alliance, site 1 and PCTs fall into the negative, high-frequency quadrant. Figure 35 shows that for the cluster the most dominant theme is TOBACCO, followed by SMOKING, LOCAL, SUPPORT, GROUPS, SMOKEFREE, SCHOOL, ENSURE, SMOKING, YEAR, TOBACCO, CIGARETTES and PROJECT. The proximity of TOBACCO, LOCAL and GROUPS are overlapping. This indicates that they are related to each other in a chain-like manner. YEAR, SCHOOL and PROJECT are semantically isolated. 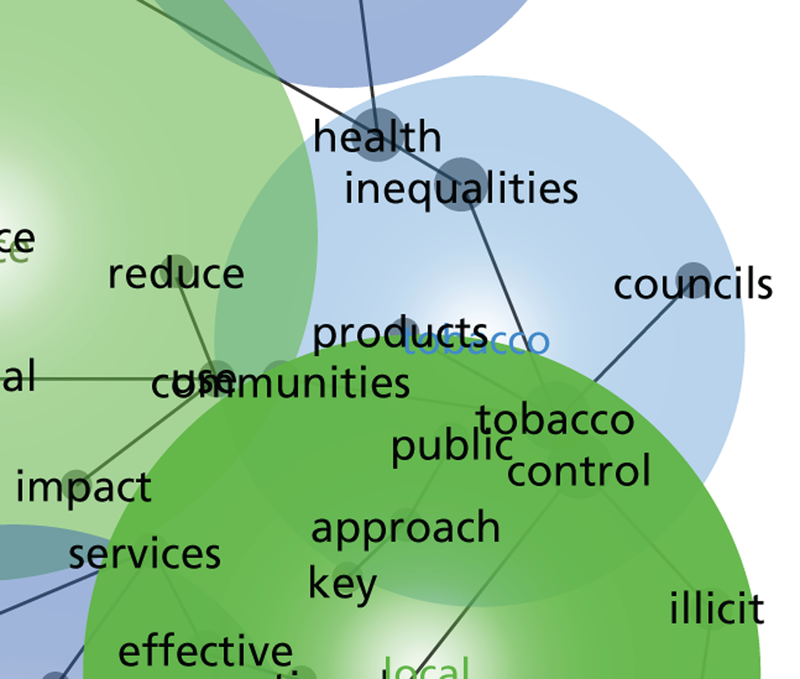 The concepts of council, control, products, public, communities and inequalities are directly connected to the dominant theme of TOBACCO (Figure 36). The theme of SCHOOL is semantically isolated from the dominant theme of TOBACCO. FIGURE 35 Leximancer default positions map of the documentation for site 1. General concepts are in black with themes in colour. FIGURE 36 Close-up of the TOBACCO theme from documents for site 1. The term ‘routine and manual’ (R&M) is widely used by NHS partners, but is less commonly used by councils where deprivation and geographical classifications take precedence over occupational classifications. R&M smokers are defined by their occupation according to the Standard Occupational Classification (SOC) codes where jobs are classified by their skill level and skill content. The SOC codes for R&M groups include occupations such as lower supervisory and technical or routine and semi-routine occupations. While R&M smokers are defined by their occupation, most non-employed people (the unemployed, the retired, those looking after a home, those on government employment or training schemes, the sick, and people with disabilities) are classified according to their last main job. This means that many individuals who fall into the R&M category are not employed in R&M occupations. This qualification is important, particularly in the context of the current economic climate, with increased unemployment levels and worklessness being a key priority for many councils. 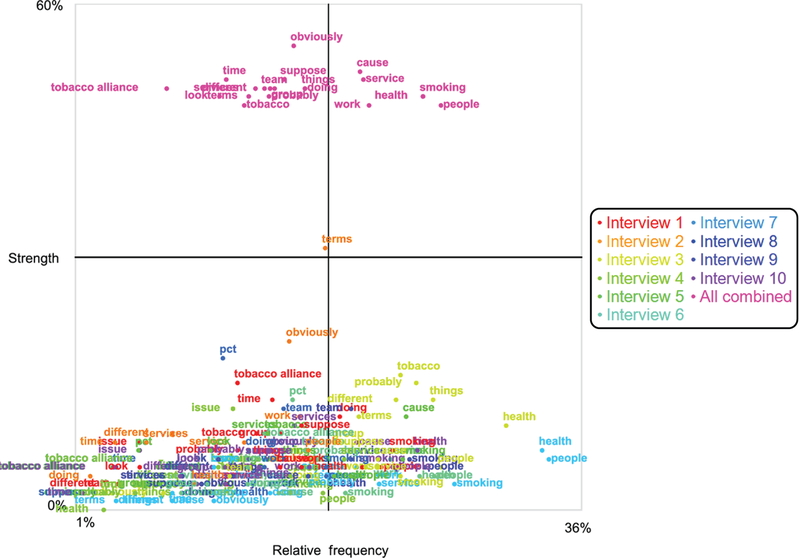 FIGURE 37 Cognitive analysis quadrant of top 20 concepts: frequency and strength results for site 1 with comparison with all interviewee data for the same site.